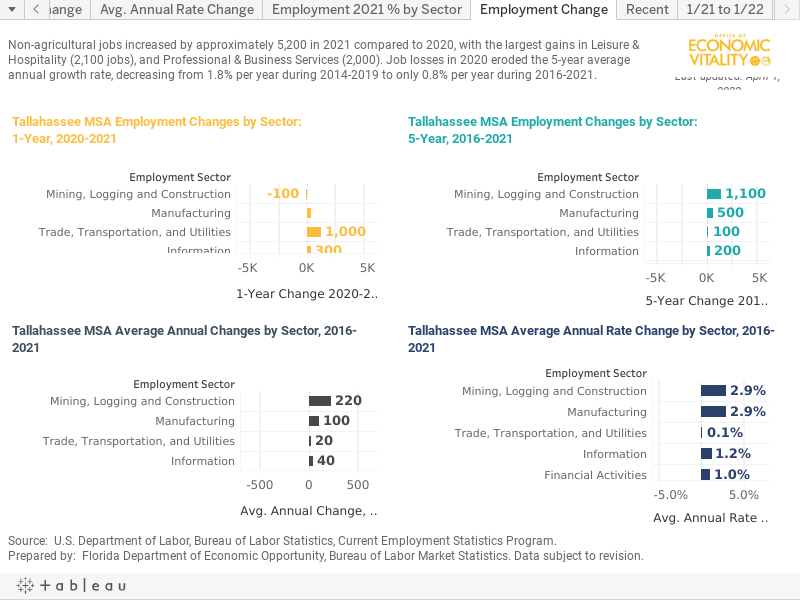 The Office of Economic Vitality is the region’s most comprehensive economic data source.  Our dedicated team of expert analysts track approximately 80 metrics – providing all the information you need to get to know us quickly and well. 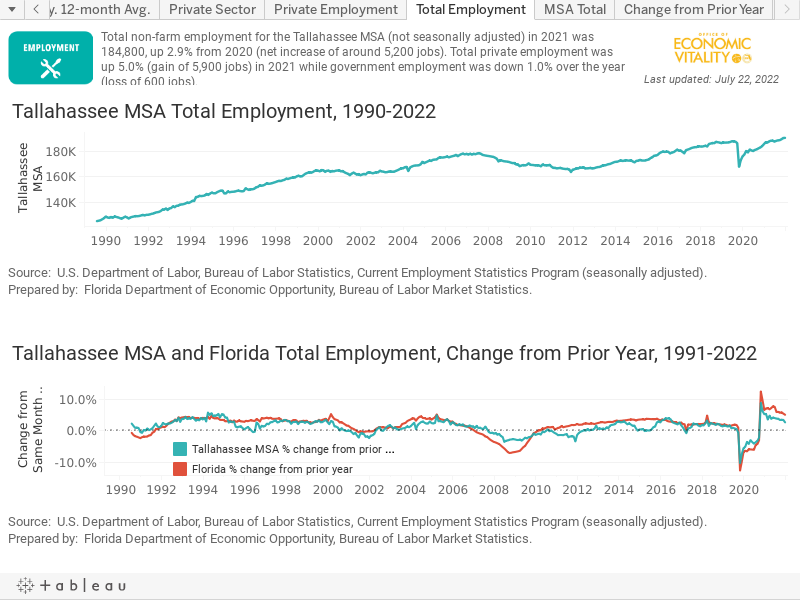 Use the interactive graphics to see how our past and present are shaping the bright future of Florida’s Capital Community. Simply click on any of the following categories to quickly access the information you need: Workforce & Income, Residential & Commercial Development, Economic Factors, Community & Environment, Demographics, Education, and Innovation. For a comprehensive list of Annual Data Downloads, please see our Statistical Digest. 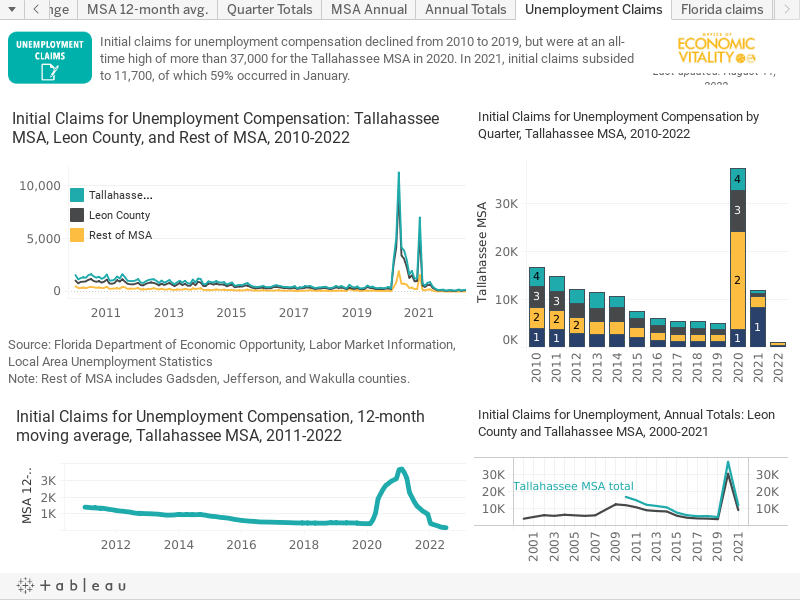 Total non-farm employment growth for the Tallahassee MSA for 2018 was 1.9%, a net increase of 3,500 jobs. Comparatively, 2017 job growth was 1.1%. Total private employment was up 3.1% (gain of 3,700 jobs) while government employment was down 0.3% over the year (loss of 200 jobs). 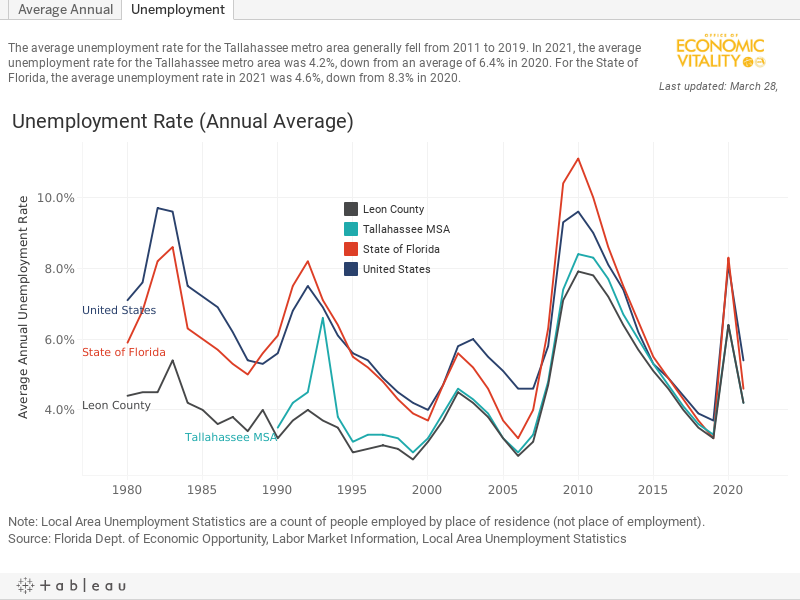 Leon County’s annual average unemployment rate for 2018 was 3.4% (3.5% for the Tallahassee MSA and 3.6% for the State of Florida). Private sector job growth in 2018 was led by gains in Professional & Business Services (1,100 jobs); Trade, Transportation, and Utilities (1,100 jobs); Mining, Logging & Construction (700 jobs); and Education & Health Services (500 jobs). The average annual wage in Leon County in 2017 was $41,713, 12.7% below the state average wage of $47,767. By industry type, Leon County’s average annual wage ranged from 32% lower than the state average for the Information industry sector to 5.5% higher than the state average for the Professional and Business Services industry sector. Initial claims for unemployment compensation declined for the ninth straight year in 2018. Taxable sales data for various Metropolitan Statistical Areas (MSAs) are popularly used as one indicator of regional economic activity. These data are derived from sales tax returns remitted to the state Department of Revenue each month. Taxable sales are those sales subject to Chapter 212, Florida Statutes. Sales tax is levied generally on sales of goods, but not services, although there are some taxable services. 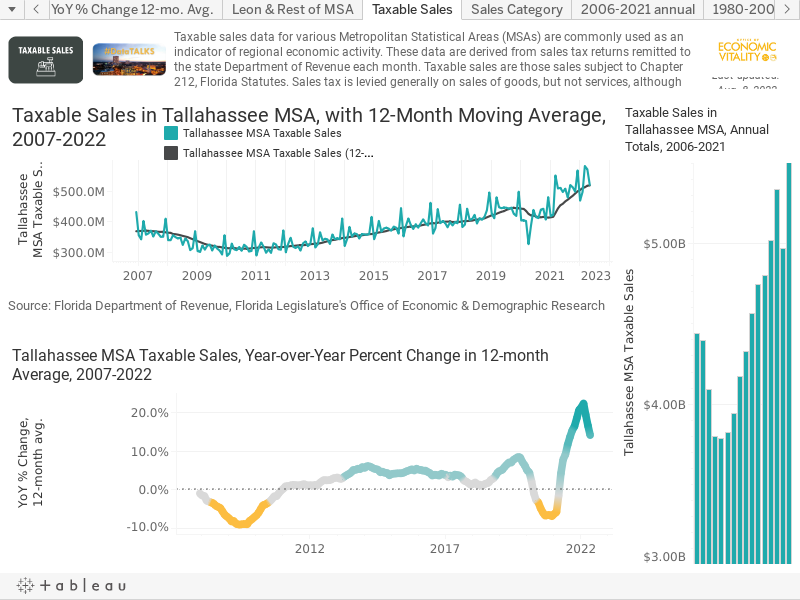 The overall level of taxable sales increased 4.5% in the Tallahassee MSA in 2018. For the Tallahassee MSA, Building Investment was up on average 7.8% each year between 2014 and 2018; Autos & Accessories, 5.5%; Building Investment, 7.8%; Tourism & Recreation, 3.7%; Consumer Durables, 1.5%; and Consumer Nondurables, 1.5%. Taxable sales comprise an estimated 40-45% of all retail sales. In FY 2018, 2,368,988 visitors visited Leon County, up 0.4% from FY 2017. Direct expenditures of visitors totaled $576.2 million in FY 2018, an increase of about 1.6% from FY 2017. 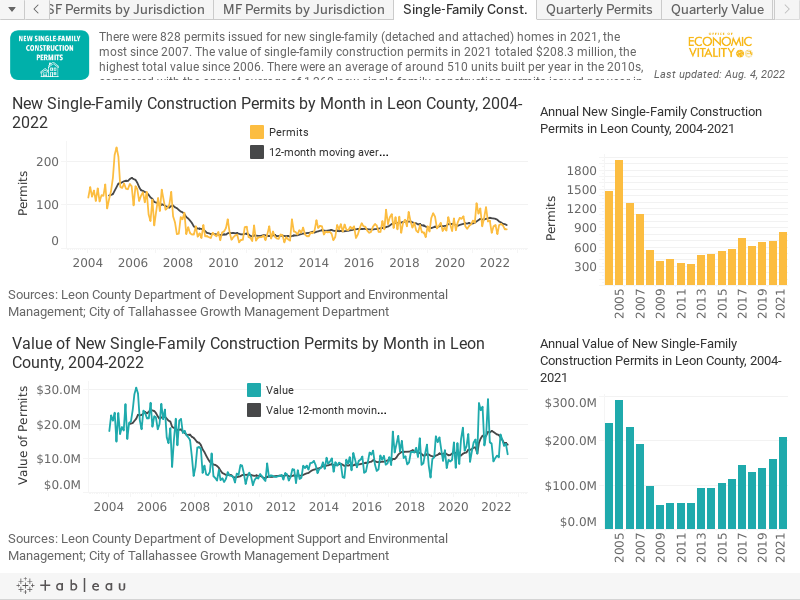 The overall level of residential building permits for new construction issued in Leon County has continued to steadily increase over the past few years. 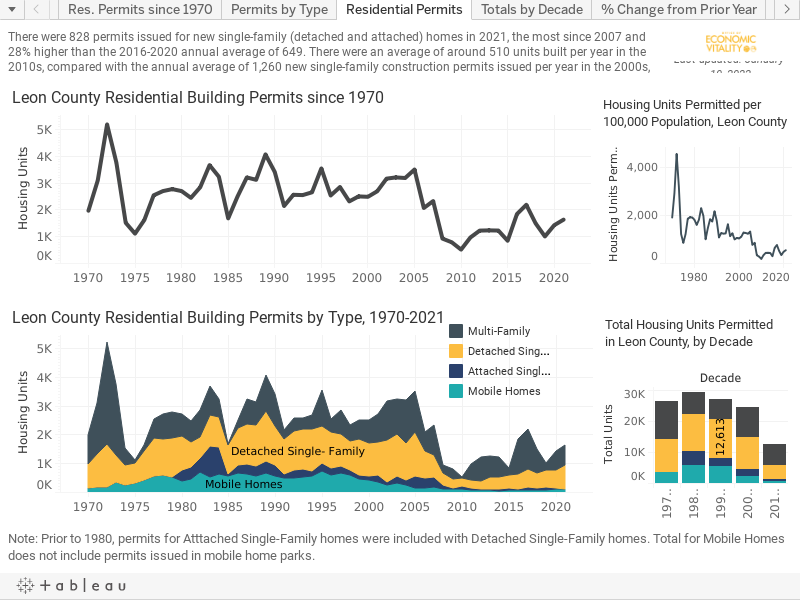 There were about 600 permits issued for new single-family (detached and attached) homes in 2018, well below the historical annual average of 1,224 new single-family construction permits issued per year since 1970 (earliest Planning Department records available). 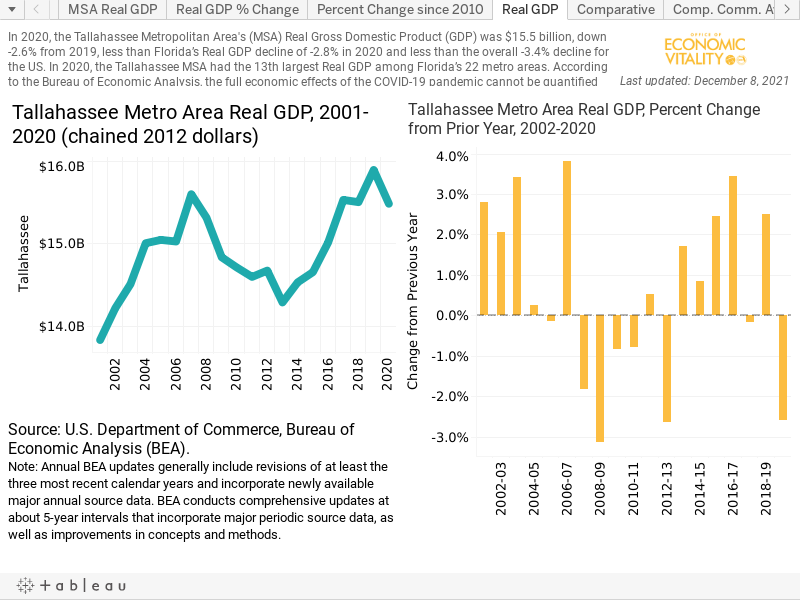 In 2017, the Tallahassee Metropolitan Area’s (MSA) real gross domestic product was $13.8 billion, up 3.1% from 2016. The median sales price for single family homes was up 5.1% in Leon County and 4.9% for the Tallahassee MSA (2018). 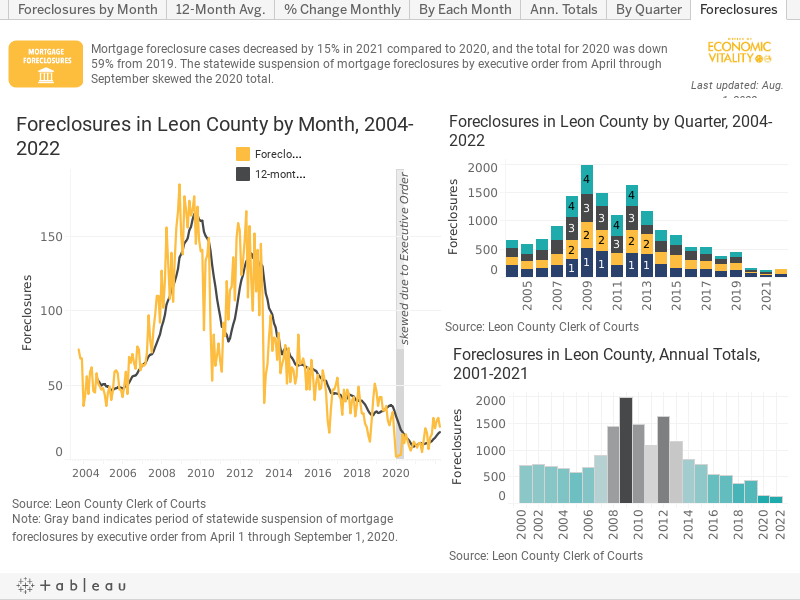 Mortgage foreclosure cases totaled fewer than 400 in 2018 (lowest annual total since before 2004), the sixth consecutive year of declining rates of mortgage foreclosure cases in Leon County and only about one quarter of the 2012 total. 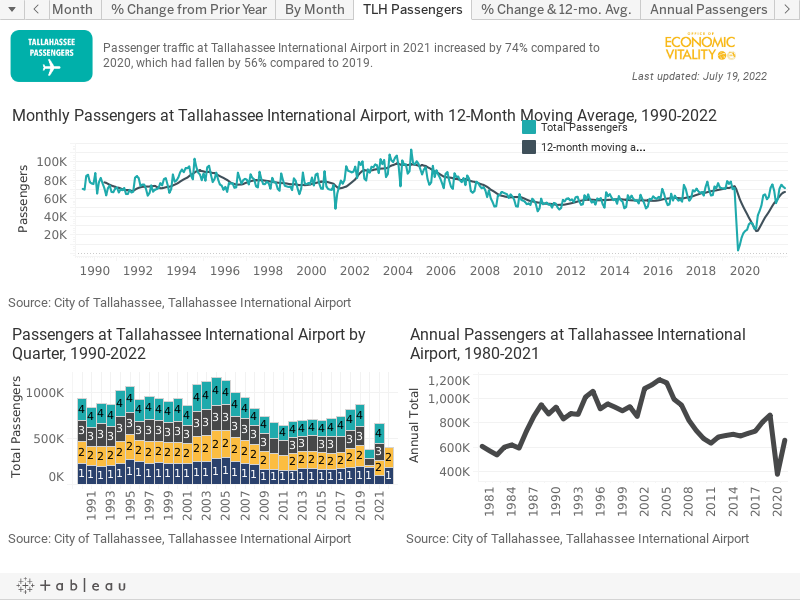 Passenger traffic at Tallahassee International Airport increased about 10% in 2018 from 2017 and was 19% higher than the 2010-2015 annual average of 680,846.